A promise is a promise. Which means whether you make it in your personal life or for your professional organization, keeping promises matters and breaking them leaves a mark. We’re all familiar with the feeling created by a broken promise – it hurts. In the corporate world, breaking the brand promise hurts your customer’s trust in your brand and creates a feeling of deception. The larger the scale of the relationship, the harder it is to repair the break. Today, more than ever, customers are vigilant about the brands they interact with. They do their research seeking brands that are authentic, honest and do what they say they will do. The customer essentially owns a brand’s reputation. When a brand follows through with its promises, a loyal and proud customer base will rise up, tell friend after friend, and carry that brand to the promised land. If a brand breaks its promises, it also shatters its customers’ trust. As a result, they’ll not only stop the relationship, they’ll tell friend after friend, and thanks to the virality of digital communications, the damage can be irreversible if the issue is not addressed genuinely. Wait a minute, let me back up and put the Promise’s position into perspective. 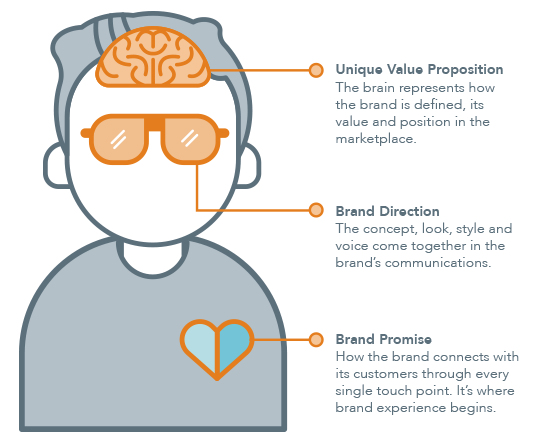 If the brand were a person, the brain would be responsible for things like market positioning and unique value proposition (UVP). The look and style of the person would represent the direction of the brand’s communication. The brand promise is the heart. The heart of the brand is how it connects with customers on a relationship level. This guidance is needed to deliver a memorable brand experience. As consumers of brands, we base a brand’s reputation on the memories we’ve collected from each interaction. The delivery of that experience may mean the difference between a one-time customer and a lifetime brand champion. It’s helpful to begin defining the promise with these elements in tow: brand personality, values and emotional motivators of target audiences, the benefits of doing business with your brand and how you are unique in the marketplace. Do your research. Interview employees and stakeholders. Identify strengths, customer needs and values, before putting a promise into action. Your employees are at the heart of delivering your brand experience. No brand promise should ever be created that doesn’t consider your employees’ ability to embrace it and deliver authentically. The promise begins as a written statement, but it’s important for everyone to understand that it doesn’t end on the piece of paper. It’s a way of “living” the brand. It’s not a code of conduct or a listing of features and benefits. Consider it a guidepost to help filter decision-making. Ask these questions. If the answer is yes, you’re on the right track. Can we rally the entire company around this statement? Is this a promise we will keep, consistently? Are we willing to stake our reputation on it? Is our promise of relevant value to our internal and external audiences? Keeping the promise is the responsibility of every person in the company, not just customer-facing employees. It also involves every touch point in the organization. From facility signage to social communications, from the bathroom to the website. Help employees translate what “living the brand” means in their specific role. Don’t assume it’s clear they understand the level of impact they can make on delivering an authentic brand experience. Consider promoting the promise internally and externally. If/when the brand begins to change its position or alter its promise, like JetBlue, be sure to include and acclimate employees during the evolution. It’s critical they understand the value of the changes being made and how to communicate the progress in order to retain customer support. Change will happen. Brands must continue to evolve to stay current, valuable and relevant to its stakeholder. Read this article on change management for helpful expectations setting on the realities of organizational change. For a brand to be truly successful in living its brand promise, there must be solidarity and resources dedicated to supporting it. This isn’t a marketing-only initiative, this involves support, guidance and commitment, especially from the top down. Consider recalibrating performance review systems. For instance, incorporating components from the brand promise will support accountability. Work in groups to think of creative ways to measure the employee efforts to live the brand promise. Discuss updating your hiring criteria. As an example, include measures that account for personality traits matching traits of your brand personality, or traits you believe are capable of delivering the brand promise. It’s simpler than you think. A promise is a promise. Keep it and your customers will make you successful. 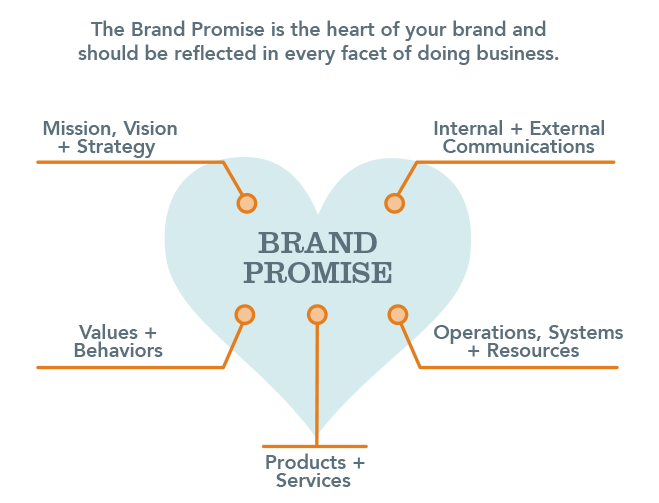 Talking about the Brand Promise is a favorite topic of mine, shoot me your comments in the section below, or feel free to reach out at susan@rmagency.com.